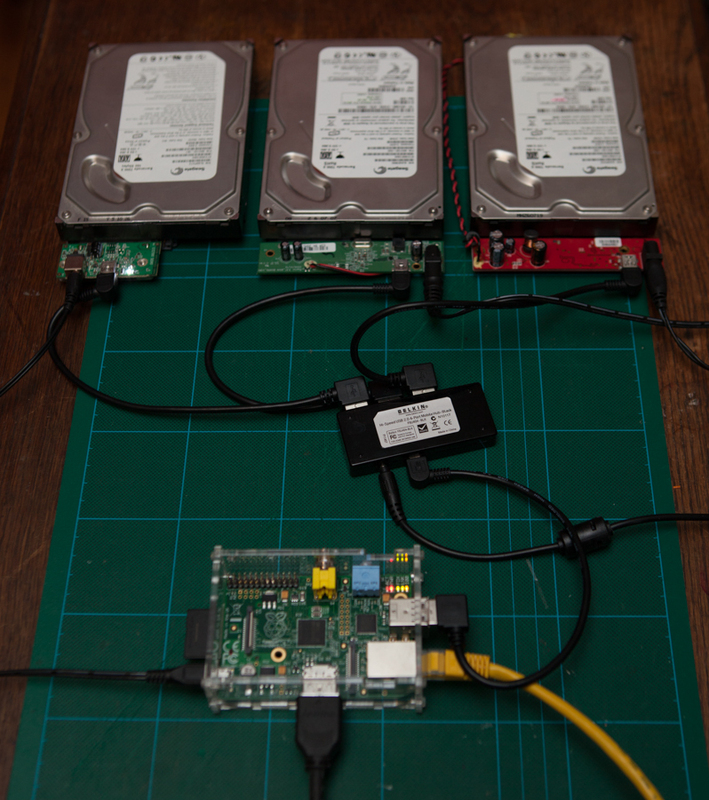 Anyway, here’s the physical setup, showing 3 drives connected to a 4-port USB hub connected to the Raspberry Pi. I had a bunch of USB to SATA controllers in a box, recovered from un-used external drive bays. 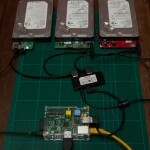 It’d be neater to get some drives in enclosures that sit neatly beside each other, or put them all in one larger case. 3 drives with 1 primary partition each. Great idea, could you initially image one drive and write it onto the other two? would this reduce the build time? Would there potentially be an issue with burning out the SD card over a short space of time due to volume of read write? If you want to try an alternative that may be significantly faster, you can use btrfs instead of mdadm + filesystem. Using btrfs with the RPi may be a serious issue if you want it for the root filesystem, but not for an external device. btrfs is still considered experimental, but I think it fits your goal. I used it to build a Time Machine equivalent. One issue can be that you used samba to transfer files to it, did you tried using FTP? I was thinking of trying the same thing for a home raid server. You’ve saved me the bother and given food for though on the speed limitations. Thanks (from Mayo).